If you happen to live in Southern California, and you find yourself in a Whole Foods, you have an opportunity to purchase wine as part of an effort to celebrate a partnership between Whole Foods Market and Santa Barbara County wineries. My assumption, though it’s not called out anywhere, is that this is a “Buy local” program. The project is called “A Collaboration” and is currently a partnership between Whole Foods and (at press time) two well-known wineries: Margerum Wines and Hitching Post Wines. The first wine, from Margerum, was available on September 30th and I acquired a bottle for free through a P.R. firm representing the effort (I have to tell you that, but I would have anyway). 51% Syrah (53% Colson Canyon Vineyard clone 877, 37% Great Oak Ranch Vineyard and 10% Purisima Mountain Vineyard that was pulled from a new Francoise Freres barrel), 32% Grenache (58% Alamo Creek Vineyard and 42% Grundoon Vineyards), 11% Mourvedre from Camp Four Vineyard, 3% Counoise from Camp Four Vineyard and 3% Cinsault from Camp Four Vineyard. For me, this wine has amazing “bones” but seems to be lacking in a serious case of “living up to its potential.” Then again, I kinda felt that way about M5, too. As a general rule, I favor fruitier red wines to minerally red wines, and am especially not enamored with Napa Cabernets because of that dusty, chalky thing everyone loves so much. To me, the Margerum wines seem to be reaching for Napa (and falling short) instead of embracing what makes wine from Santa Barbara County and the rest of the Central Coast so unique and enjoyable… the fruit. I consider the other wines coming out of these vineyards, made from the same grapes (Tensley, Qupe, Tercero, Epiphany, and Beckmen come to mind), and I’m disappointed in the lack of body, the lack of anything interesting happening on my mid-palate, and the short finish. A Place – Terravant Wine Company in Buellton, CA, where Gray Hartley and Frank Ostini of Hitching Post Wines are writing the next chapter. A Story – of making wine since 1979, in a garage, a shed, a co-op, and now this ultra-modern winery. 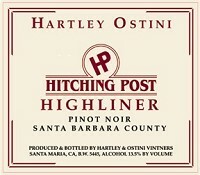 From humble beginnings to high tech, Hartley Ostini continues to created traditional wines of balance and finesse. The Fruits – This is a 22 barrel selection blended and handcrafted by Gray Hartley and Frank Ostini, and includes 73% Valdiguie grown by Hank Ashby at French Camp Vineyard near Shandon, and 27% Syrah grown by Loren Colahan at Alisos Vineyard in the hills above Los Alamos. I’m going to let you in on a deep, dark secret – one that has been burning inside the most hidden recesses of my soul: I can’t identify different red wines, based on taste alone. Yeah, I know. And sometimes I leave the dirty dishes in the sink overnight, too. Sue me. But this secret bothers me and I have vowed to do better, so the other night I made a move to change my life. I drove over to BottleRock – Culver City, and told my-favorite-waiter-who-never-gives-me-discounts-even-when-I-flirt-like-a-crazy-girl, Byron, to line up some reds and let me puzzle through their mysteries. I also ordered a grilled cheese sandwich. Cute little British Byron said he’d help me out and help me out he did! After disappearing for a few minutes, he returned to my table with four glasses containing two-ounce pours, and lined them up on a diagonal. Byron gave me instructions on the order in which to try each taste, and then bounced merrily away like some benevolent spirits pixie, tending to the thirsty masses. Out came my notebook and down the hatch went the first wine. plum and raspberry and cherry. It tasted of rich, ripe red fruit but felt a little oily. It had a medium body and a short finish. I thought it was a Cabernet. My next taste smelled like a combination of dill, fennel and cherry – but was very pleasant, despite the somewhat odd-sounding mix. On the palate this wine was floral and herbaceous and really lovely, with definite strawberry notes and high – but not overwhelming – acid. It was a little thin, but ended up being my second-favorite pour. I noted that this wine was probably a Shiraz. Wine number three was big and jammy. It smelled and tasted like cough syrup, but not in a super sweet way. Again, I picked up some dill on the nose, but on the palate it was mostly cherry. This pour was huge and hot, but contained smooth tannins. “I’m picking up tannins,” thought I, “so this is probably a Cab!” I decided I had been wrong about the first wine and crossed the varietal off my notes. I told you I have no idea what I’m doing. The final pour had a nose of plum, a little hay and a bit of petrol, so when I tasted it, I was incredibly surprised at how smooth and delicious it was. This wine was massive, with a silky mouthfeel and flavors of delicious plum. It was a little hot, but all of these wines seemed to need age or decanting. This was another favorite. I decided it was a Pinot Noir, because I like making stuff up. Wine consumed, sandwich finished, Bryan sprang back to my table and took a look at my notes. To his credit, he didn’t laugh at me at all – not even once – which is why I love him, even though I always have to pay full price. My second tasting was not a Shiraz, as I had thought, but a Zinfandel – a 2006 Puccioni Zin from the Dry Creek Valley, in Sonoma County, California ($28). I love Zinfandel; it’s one of my favorite varietals. And apparently I can’t tell a Zinfandel from a hole in the ground. Or from a Shiraz. Man, I’ve got some catching up to do. Wine three – the one I so wisely guessed was a Cabernet based on the tannins – was a 2005 Robert Keenan Winery Merlot (about $35 per bottle). A big Merlot, mind you, but still not Cab. Finally, wine four was a 2006 Josh Cellars Amber Knolls Cabernet Sauvignon, from Napa Valley (about $15 a bottle). If you know anything about wine, you know that Cabernet Sauvignon is not really the same as Pinot Noir. Oops. So how did I get all of these wrong? More important, what should I remember for next time? Pinots tend to be lighter in body, but are often complex and aromatic. New World Pinot Noir is more fruit-driven than Old World Pinot Noir, but I find that this is – in general – a given for all New World vs Old World wines. Pinot also possesses a more earthy character, often containing notes of mushroom/truffle, smoke, spice, tea or floral perfume. I only picked up on the heavy fruit in my Pinot pour, which pinned this as a New World wine. In my defense, I did register its lighter body, too, but I didn’t sense a trace of earthiness. But maybe that’s my bad. Because of the huge variation in alcohol from one Zin to another (anywhere from 13% to over 18%), this wine presents a very diverse flavor profile. The term “jammy” is pretty popular as a description, since Zinfandel tends to possess big, concentrated blackberry, boysenberry, raspberry and/or black cherry fruits. But often woven within the chewy flavors are hints of black pepper, clove, anise and herbs. The more alcohol, the bigger and more concentrated the Zin. These are the “monster Zinfandels” you may have heard about. However, these 16%+ alcohol heavy hitters lack balance and acidity, and therefore don’t pair well with food. In the taste that I tried at BottleRock, I detected some of the herbs in the wine. Also, this must have been a lower alcohol Zin because I didn’t get drunk found the pour to be thin and high in acid. Are big, bold, bad (in a good way) motor scooters. Despite having two different names, these are actually the same grape. It’s also known as Hermitage, but that name is a protected French designation (like Champagne). Australian and South African producers call the wine Shiraz. If it comes from France, the United States, Argentina or Chile, it’s labeled Syrah. These wines display firm, smooth tannins, and are medium-to full-bodied. Huge black cherry, blackberry and plum fruits are common, but so are more exotic notes of bell pepper, black pepper, spices, licorice, lavender, chocolate, vanilla bean, smoked meats and musk. If you remember, I found the wine I described as Shiraz to be herbaceous (not spicy) and thin. See where I went wrong? Merlot can be soft and mellow or big and bold. Obviously, the tasting notes will be different, depending on the heft of the wine. In general, Merlot presents with fruit-forward black fruits like blackberry and plum and blueberry. It can also contain cherry and currant. It is also common to pick up floral flavors and stronger notes like cocoa, black pepper, clove, caramel, bay leaf, green peppercorn, green olive or bell pepper. With a bigger Merlot, you might find yourself chewing through smoke, tar, coffee, leather, cedar or cigar box. Milder Merlot will be more floral, with toasty tastes of vanilla and coconut and sweet wood. It is also worth mentioning that, although usually on the softer side, Merlot can be tannic – especially bigger Merlot. This might be why I got my pour confused with Cab Sav. “The noblest of all grapes,” “the king of red wine grapes,” the darling of collectors and connoisseurs, Cabernet Sauvignon contains the most tannins of any other wine – love it or hate it – which makes this the best wine around for aging. Cabs can present a similar set of flavors as Merlot, although Cab Sav is not as sweet and soft as Sideways-maligned Merlot. Cabernet Sauvignon ranges from medium-to full-bodied and the tannins support all that plummy, berry fruit. Depending on the way it’s aged, Cabernet Sauvignon can also be rich, warm and spicy on the palate, with notes of vanilla or tobacco, warm spice and sometimes leather, toast or tar. Some fancy folks talk of pyrazine, which is a green pepper or sometimes asparagus-like flavor imparted from under-ripe grapes. This is not a wine fault, and is often attributed to growing influences. The fact that I thought this pour was a Pinot is proof that I need to drink more. Maybe I’ll do this with another blind tasting at BottleRock and a full glass of the MacMurray Pinot Noir to start. One can hardly visit the Santa Ynez Valley and not notice the effect of the movie Sideways. I never visited before the movie so I can’t be sure what was different then (probably fewer tourists and less usage of the words “sideways” and “pinot noir”), but the impact of the film is obvious when you visit the area. It’s the most obvious when you visit The Hitching Post II restaurant and bar on Highway 246 in Buellton. You can drive the route that Miles stumbled, you can hang out at the bar where he drowned his sorrows in Pinot Noir, and now you can even see pictures on the wall of the cast and crew when they were filming. I was personally more interested to see what all the hype was about than I was in reliving the movie, but it was a bit surreal. Up until a few weeks ago my interest in Hitching Post was nil specifically because of all the hype and I’d avoided the scene on previous trips. This time though, I squeezed it into our itinerary for a few reasons. First, I’d recently tried the Cork Dancer Pinot Noir at the Viceroy in Santa Monica at a friend’s birthday party. They have it on their Happy Hour menu (which goes until 9pm) for $6 a glass. That’s a deal for any wine in this town and it’s a great deal for good wine. The second reason we went there on this trip was that we were spending the night in Buellton and its gravity sucked me into a vortex of curiosity (that, and we needed to eat dinner in the small town). Lastly, I saw on their website they do a full wine tasting at their bar for $7 until 6pm. THIS was a reason to go! We arrived around 5pm (we had a 6pm reservation–I HIGHLY recommend making reservations and going early. People were waiting in big crowds/lines for a long time.) and found a spot in the bar area which was eerily familiar (I’ve only seen the movie once but the images from inside HPII were burned into my brain). We ordered a couple of tastings and settled in to try the 7 pours of infamy before dinner. Note: The website is a little out of date and the wines available for purchase aren’t all the same vintages as I tasted so the notes and prices may be a little askew. Well, their notes might be… mine are probably as askew as they always are! What they say: Beautiful aromas of strawberry, cherry and rainbow sherbet. Brilliant color and fresh crisp flavors makes this a joy to swirl and sip. What they say: A blend of six vineyards that stretch from Santa Maria through Los Alamos and into the Santa Rita Hills. Bright fruits, medium body, a well proportioned great drinking everyday pinot. What Jess says: The nose was like other earthy local Pinot Noirs. (I find that Pinots from this area of a distinctive nose that I can always detect, no matter what the winemaking did to the wine.) It was a beautiful light red with a nice feeling at the back of the mouth. I detected berries in this well-balanced Pinot. I liked it as much as I did at the Viceroy, too. While I like this wine, I’m not sure most of us think $27 per bottle is an “everyday” wine. What they say: Dark fruits, good structured blend of Sanford & Benedict, Fiddlestix and Clos Pepe Vineyards. All Santa Rita Hills. Aromas of earth and cherries. Deep purple color with warm flavors of berry and spice that linger. What Jess says: The nose was detectably earthier and stronger than the Cork Dancer. When I tasted it my first response was YUM. Blueberries and blackberries slinking seductively across the tongue in this smooth well-balanced Pinot Noir. For $7 more, I’d choose this over the Cork Dancer. What Jess says: The nose had a very particular smell about it that I couldn’t put my finger on. I tasted cherries. This wine was super smooth and a long, silky, wonderful finish. WOW. I can see why this wine gets so much attention and it tastes like it’s their pride and joy. But even still, we didn’t buy any of this wine because it’s still out of reach for most people. What they say: Generation Red honors our parents and grandparents who first introduced us to wine at the dinner table, and our children, who have shown a keen interest in winemaking as inquisitive youngsters and excited young adults. With this bottling we focused on high quality sources: 20 yr old Cabernet Franc from Alisos Vineyard in the hills above Los Alamos, meticulously farmed Merlot from Westerly and Gainey vineyards in the Santa Ynez Valley, and small amounts of White Hawk Syrah and Bien Nacido Refosco. This blend is mainly Cabernet Franc and shows a young rustic character with dusty, smoky aromatics. Excellent with food. What Jess says: The nose smelled “Cabby.” I tasted cola and “purple” fruit. I found the wine smooth and interesting (in a good way, unlike the Porque No! red blend from Napa I just tried that found to be interesting in a notsogood way). This wine said to me, “Buy me!” So I did. A great value in a unique and high-quality wine. What they say: I can’t locate their tasting notes on this one. What Jess says: I’m not a fan of Merlot, but at this point my notes just say “too buzzed to care.” That’s me, slackin’ on the job! What they say: This cuvee honors the Big Circle Riders who surrounded the cattle to bring them together are the roundup, where our style of oakwood grilling got its beginnings by feeding the cowboys after a hard day’s work. Today we gather Syrah grapes from various Santa Barbara vineyards, and bring them together in this wine that combines the structure and intensity of cool sites with the broad flavors of Syrah grapes from warmer vineyards.This wine is ripe, juicy and flashy. Showing notes of black cherry and cooked plum with polished edges. What Jess says: Red berry and chocolate on the nose. Nice, chocolate, black cherry, pepper, and plum in the mouth. A little more expensive than I normally spend, I bought a bottle anyway because it was very good and I’d look forward to serving it to guests. At this point in the evening, our reservation was up and we were drunk. WE is a noteworthy comment because Mitch RARELY gets drunk. The tasting pours were very generous and we were on an empty stomach (especially Mitch because at least I’d had some snacks at the Vino de Suenos event earlier in the day where I’d met and spoke with Frank Ostini–super nice guy). We ambled over to the hostess stand, and were promptly seated as we walked past hordes of jealous restaurant-goers. Folks, I gotta say, this place is like a time warp. What it’s not though is snobby or elitist. When I met Frank Ostini earlier in the day, our conversation led me to believe he’s a genuine guy who believes in the good things in life: Good food, good wine, good friends, and doing what you love with honesty and integrity. I got that sense at the restaurant, too. Not everything we tried was a winner and the veggie tray that they brought out when were seated was peculiar, right down to the 1970’s aluminum serving dish the veggies arrived in. We ordered a couple of appetizers (I liked the mushrooms, Mitch didn’t) and dinner. Mitch had pork chops for dinner and I had a cut of their famous BBQ steak. The steak was incredible. The most flavorful, moist, and tender piece of meat I’ve ever eaten (and I eat a lot of meat). I can’t recommend the steaks highly enough. At any rate, if you’re a Sideways junkie, a Pinot Noir lover, or just want to take a trip back in time to the late 70s, add the Hitching Post II to your itinerary and make a reservation! About a year ago I decided to try an experiment. It was this: use the Wine Spectator region/year rating system to pick out wines even when I've never heard of the vineyard or winemaker (which constitutes at least 90% of wines I encounter). I can honestly say I've never been disappointed with this wine-buying method. Here are some example region-vintage combinations that I like, and the full list of winners as decided by Wine Spectator (who I trust for their wine reviews explicitly… better than Parker in my opinion). Last week I was out for happy hour with a friend at my favorite wine bar in town (Bodega Wine Bar in Santa Monica) and I ordered a bottle I'd never heard of, but it was a 2005 Tempranillo from Ribera del Duero and since I love that Vina Santurnia I figured it was worth a shot. We both enjoyed the wine! Try this! If you don't have a Wine Spectator online subscription and you don't want to purchase one just to get your hands on this list, I found pre-printed copies of it at my favorite local wine store… yours might have them, too. It's called the Vintage Ratings chart. At least a year ago, Mitch and I had dinner at a great restaurant in one of my favorite local hotels. It's a seafood restaurant called Catch and it's located in the Hotel Casa del Mar in Santa Monica (beachfront, of course). Sometimes when we go to nice restaurants we like to ask the waiter for a suggestion on the wine, since they usually know better than we do what the wines are like. Our fantastic waiter (who had an equally fantastic assistant waiter) chose an Ortman Pinot Noir for us and we loved it. We loved it so much that it went on my list of wineries to visit when we get up to Paso Robles… and so we did. The lovely tasting room is located in the middle of downtown Paso Robles (1317 Park Street, Paso Robles, CA 93446), a few doors down from Artisan (the restaurant we brunched at right before starting our tasting adventure for the day). The woman pouring the tasting was friendly and knowledgeable and was proud to be working for this winery. That's a great start to any tasting! “We specialize in artisan wines crafted in the acclaimed “Ortman style,” which is founded on four decades and two generations of family winemaking experience. The Ortman style emphasizes richness, elegance, and food friendliness, as guided by the father-and-son winemaking team of Chuck Ortman and Matt Ortman. The standard tasting fee was $6 (not charged if you purchase wine) and I think they offered souvenir glasses but they were the stemless variety of which neither Mitch nor I are fans (plus we don't have room in our tiny kitchen for more wine glasses, we already have at least 20 hanging around) so we left them behind. They also had a Reserve Tasting with a tasting fee of $10 which does include the Ortman logo Riedel glass, but does not get refunded if you purchase (at least that's the formal policy, we didn't pay for either tasting). Naturally we chose one of each so we could both sample the full selection and not be too blotto to move onto our next victim, er winery. What they say: This wine is crafted in the tradition of the dry roses that are favored in the warmer climates of Europe for their refreshing, food-friendly qualities. A round, supple texture bursts with fresh flavors of white peach, strawberry, and cinammon. Are you tough enough to drink pink? What Mitch said: Thumbs up! Bright clean bouquet with a fruity pucker. What they say: They don't call Chuck Ortman “Mr. Chardonnay” for nothing! From Firepeak Vineyard in Edna Valley, this Chardonnay exhibits the classic Ortman style—rich yet clean and impeccably balanced. Flavors of pear, apple, guava and caramel with mineral accents and refreshing acidity. What Jess said: Thumbs up! Grapefruit/apple/pear (green fruit, light citrus) on the nose. Caramel, milky, a little oak and vanilla in the mouth. What Mitch said: Mild velvety slide through the mouth. Subtle fruitiness. What they say: From the famed Fiddlestix Vineyard. Aged for 11 months in French oak barrels (40% new). Bright and broad, with high-toned flavors of cherry, plum, spice, and creamy cola. This classically elegant Pinot Noir is made for enjoying with food. Take it for a walk on the wild side of the dinner table. What Jess said: Smells like the ocean. Smooth at first with a long finish, but I didn't like the finish. What Mitch said: Surprisingly dry with a very fruity punch at the finish. What they say: Our passion for the Pinot Noir grape extends northward to Oregon's Willamette Valley, where we seek an inspiring contrast to our Santa Rita Hills Pinot Noir. The 2006 vintage comes from Temperance Hill and Parish Hill vineyards, which combine to yield a Pinot Noir with delicate complexity and firm natural structure. What Jess said: Lighter on the nose. Tingly, nutty tannins. Reminds me of French wine (of which I have extraordinarily little experience drinking). What Mitch said: Dry again. Puckery and acidic, but mild flavor. What they say: A taste of Italy from Algunas Dias Vineyard. Inspired by Matt Ortman's winemaking travels in Italy. Lively integrated flavors of raspberry, cherry, and blackberry unfold along a smooth texture. Great with pizza and pastas. Buon appetito! What Jess said: Thumbs up! Sweet, floral, and cinammon on the nose. Fruity and smooth, probably good with poultry. What Mitch said: Thumbs up! Bright nose. Starts with a berry explosion and fades slowly to a nice dry finish. What they say: From Brave Oak Vineyard. Toasty aromas of blueberry, violets, and raspberry jam. Round and supple, with juicy flavors of black cherry, plum, smoked bacon, and oak spice. While it's no sin to savor this yummy wine on its own, this Syrah will sing with skirt steak and lamb chops. What Jess said: Very typical Syrah from the Paso Robles area. Delightful, light-touch, with a familiar terroir. A spicy finish. What Mitch said: Nose goes all the way up. Minor tannins detectable, but it had a pleasant finish. What they say: Contrary to rumor, this Rhone-style blend is not named after the Iron Maiden band mascot, but rather for the swirls on our label that represent two winemaking generations coming full circle. Still, this wine does rock with big, juicy flavors of blackberry, blueberry and raspberry, mocha and vanilla bean. What Jess said: Thumbs up! Smoky on the nose. Dusty, sweet cherry and tobacco. Reasonably smooth. What Mitch said: Mildly abrasive nose, dry! Largely smooth with a medium-level of berry intensity. What they say: Five barrels were selected to exemplify the quality and character of Fiddlestix Vineyard. Flavors of black cherry, wild berry, cola and spice finish with soft, juicy acidity. This Pinot Noir will age gracefully over the next several years. In the meantime, the genie in this bottle will benefit from brief decanting. What Jess said: Smells like Fiddlehead Pinot Noirs (in addition to Fiddlehead Pinot Noirs coming from the Fiddlestix vineyard, they also make Pinot Noirs from Willamette Valley, so due to my relatively small experience with Oregon Pinot Noirs and relatively large experience with Fiddlehead wines, it shouldn't be surprising that I would make this connection). Very dry berry flavors are prominent. What Mitch said: Berry, bright, not too dry, but sadly flat. What they say: Our connection to Napa Valley's premier varietal dates back to Chuck Ortman's earliest winemaking days, when he was a winemaking consultant to some of the valley's top Cabernet producers. The 2003 vintage comes from White Cottage Ranch Vineyard on Howell Mountain. It offers juicy layered flavors of black cherry, plum, and vanilla. What Jess said: Thumbs up! Dream-inducing nose. Tastes of salty (salami! ), cloves, and blueberry with a spicy-hot finish (in a good way). What Mitch said: Thumbs up! Dancing berries on the nose. Dry, with a burnt-like finish. What they say:The 2006 Petite Sirah marks our inaugural vintage for the varietal, which joins our small family of red wines from Paso Robles. Winemaker Matt Ortman has long been a fan of Petite Sirah, and he jumped at the chance to make it when fruit from Wittstrom Vineyard became available. This vineyard occupies and idea site for Petite Sirah, yielding a wine that is big yet elegant with lusciously intense flavors. What Jess said: Makes me want to drink it with steak. Chalky. What Mitch said: Heavy nose, bitter berry. Heavy but smooth. Are you an Ortman fan? The Ortman Wine Lounge is a virtual gathering place for friends of the Ortman Family Vineyards—and that means you! This online social community features harvest videos, winemaker blogs, upcoming events, wine specials and other news, as well as opportunities to interact with us and other fellow wine enthusiasts. As an artisan family winery, we craft our wines in small lots, many of which can be difficult to find. As a member of the Ortman Generation, however, you will enjoy access to all of our wines, conveniently delivered to your home or business. On a recent trip to Paso Robles, and nearby Santa Margarita, Mitch and I stopped into the Ancient Peaks Winery tasting room. The stop made our schedule because I've been curious about Zinfandel lately (I don't like most of what I've tried) but the Paso Robles area is known for their Zinfandel and Ancient Peaks is, too. I suppose the biggest disappointment of the visit was that the 2006 Zinfandel was sold-out. This is most likely because the annual Paso Robles Zinfandel Festival was the weekend before we arrived. Oh well, better luck next time. What they say: Vivid aromas of pear, gooseberry, and lemon zest. The pear impression continues on the palate, accompanied by integrated flavors of melon, pineapple, and green apple. The texture is bright and fresh, finishing with a crisp acidity. What Jess said: Nice. Light on the nose. A hint of apple. Kinda zippy… nice. Actually, it was nice enough I bought two bottles of it because at $12 a pop, it's a very nice white to have kicking around the house for salad-night. What Mitch said: Slightly bitter, not unpleasant, light, easy nose. What they say: High-toned aromas of black cherry and blueberry with hints of cola. A smooth, silky texture brings flavors of black currant, blueberry, mocha, and vanilla cream. The finish is cool and velvety, with hints of blackberry and clove spice. What Jess said: Buttery popcorn on the nose, buttery in the mouth. Cherry. Also nice. We tried it a second time and I found it less exciting the second time around. What Mitch said: Tarry finish at the back of the mouth, but light. More sour than bright. What they say: Warm plum and spice aromas with smoky-earthy nuances. The palate bursts forth with bright rounded flavors of black cherry, plum, cola, and mocha. The finish lingers with long fruit and supple tannins. What Jess said: Bacon on the nose. Big up front with a diminishing finish. I'm not crazy about this wine, and I found it a little boring (and I generally like Syrah, especially from this region). What Mitch said: Uvula firecracker. First it's smooth, then it burns and finishes flat. What they say: Intense aromas of black fruits and leathery spice. The palate is deep and juicy, unfolding with ripe flavors of plum, cassis, black cherry, and mocha. Supple tannins are interwoven into a long, chewy finish. What Jess said: Not much on the nose, but gentle and pleasant in the mouth. I thought it might be a little chocolatey. It had a long but delicate finish. Definitely tasted the Central Coast terroir in this Cab. We tasted this one a second time too, and it was notably sweet the second go-around. What Mitch said: Pungent nose, flavorific but not heavy. I found this on Bizrate for $12.95 if you'd like to give it a try. What they say: Aromas of raspberry plum, rhubarb, and forest floor. Deep jammy flavors of boysenberry and blackberry anticipate accents of cedar, tobacco, and Asian spice. Juicy tannins embrace a supple, smoky finish. What Jess said: Gentle on the nose, longer finish than the others, easy on the tannins, nice but not awesome. Maybe at $20 a bottle I'd feel differently. What Mitch said: Medicinal nose, bright, crisp flavor, smooth. What they say: The 2006 Petit Verdot offers warm black fruit aromas with accents of lavender and pencil shavings. The palate bursts with fresh flavors of wild cherry, black currant, cola, and coffee with hints of peppercorn. Firm tannins are balanced with bright acidity for a clean, focused finish. What Jess said: It's kind of like sour cranberry juice. A little acidic to my nose, maybe it just needs to be aged? What Mitch said: Burnt berry nose. Smoky flavor all around. What they say: The 2006 Petite Sirah is loaded with exotic aromas of blueberry, cigar box, anise, white pepper and pomgegranate. Luscious flavors of blackberry, black cherry, vanilla bean, and cinnamon spice unfold along a big, chewy texture. Dusty tannins add structure to a long, juicy finish. What Jess said: Blueberry and sesame on the nose. Chalky and sweet in the mouth. Another wine showing the strong Central Coast terroir. What they say: The 2006 Oyster Ridge is an artful blend of Cabernet Sauvignon, Petite Sirah, Syrah, and Zinfandel, and was crafted to exemplify our finest winemaking efforts. The bouquet brims with accents of black fruit, rose petal, toasty oak and graphite. A complex tapestry of flavors includes blueberry, blackberry, vanilla, mocha, and anise. Firm tannins and exquisite balance ensure that this wine will reward careful cellaring. What Jess said: Smoky, like barbecue sauce. Smooth finish. We liked this one but without a cellar (or even proper wine refrigerator), we don't invest in wines this expensive. And we're not sure it was worth the $50 price tag. What Mitch said: Mild nose, spicy finish. Hits at the back of mouth but is light on the tongue.